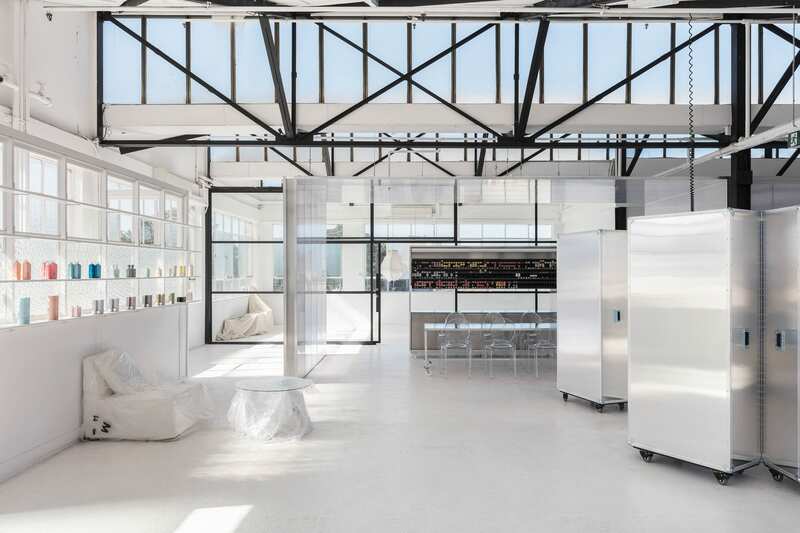 George Livissianis – the interior architect responsible for a smattering of Sydney’s most arresting spaces – has turned his design magic on an inner-west hair salon. 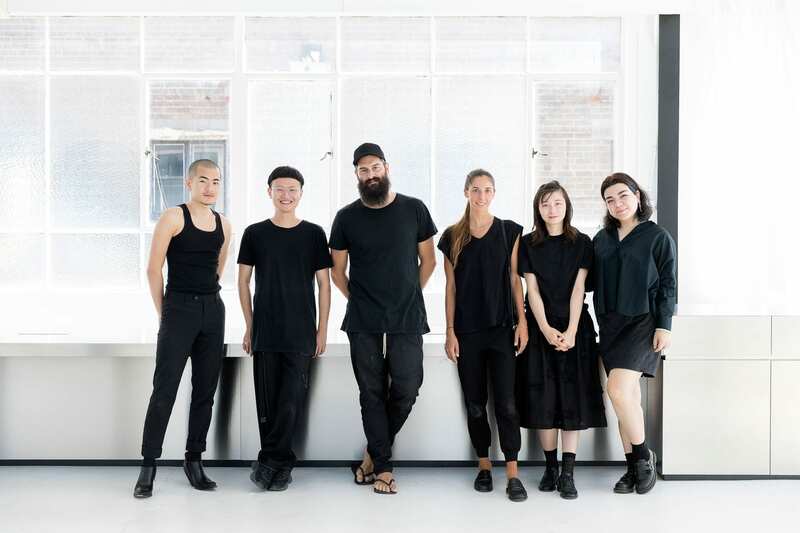 is pitched as a genderless salon, and with its new George Livissianis refurbishment, has become a sleek monochrome gallery and a blank canvas for creative director Daniel Jianing Liu’s hair artistry and his super stylish clients’ desire for something a bit different when it comes to cut and colour. 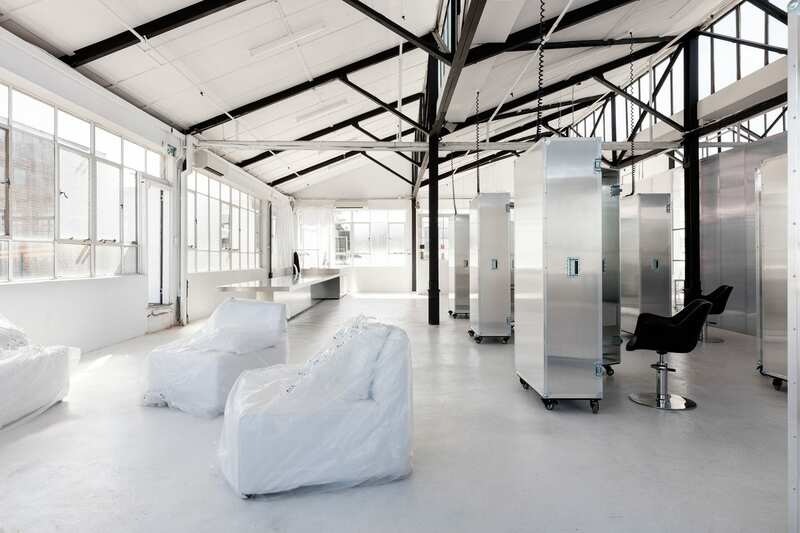 Housed within Precinct 75 (a cluster of repurposed industrial buildings in St Peter’s that includes the old Taubmans paint factory), the 300 square metre minimalist-style salon has been created to be flexible and totally mobile. 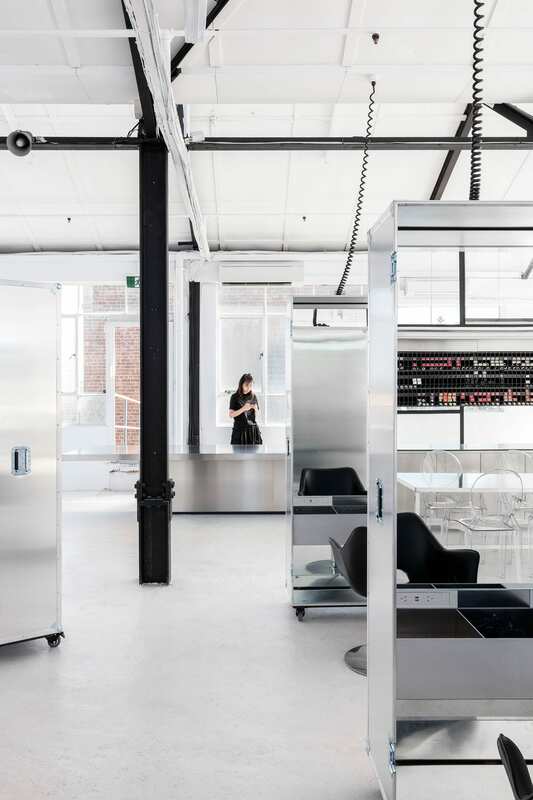 With pack-away pods as cutting stations, airplane trolleys, freight, and music cases – the salon can be rolled up and moved to make way for hair seminars, demonstrations, and artist and designer collaborations. 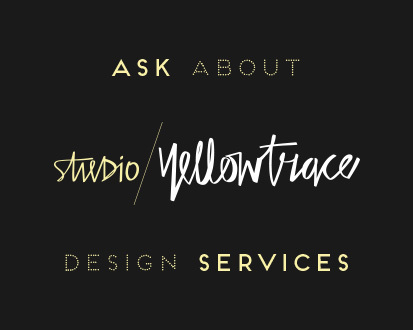 Related: Stories On Design // Grooming Spaces. 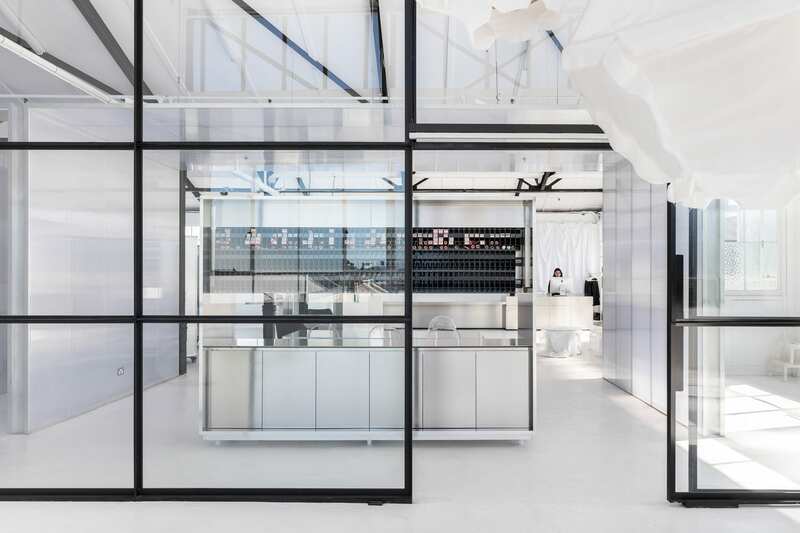 Beneath a canopy of black steel struts, the palette of the space is brilliant white, clear plastic, and silvery aluminium. 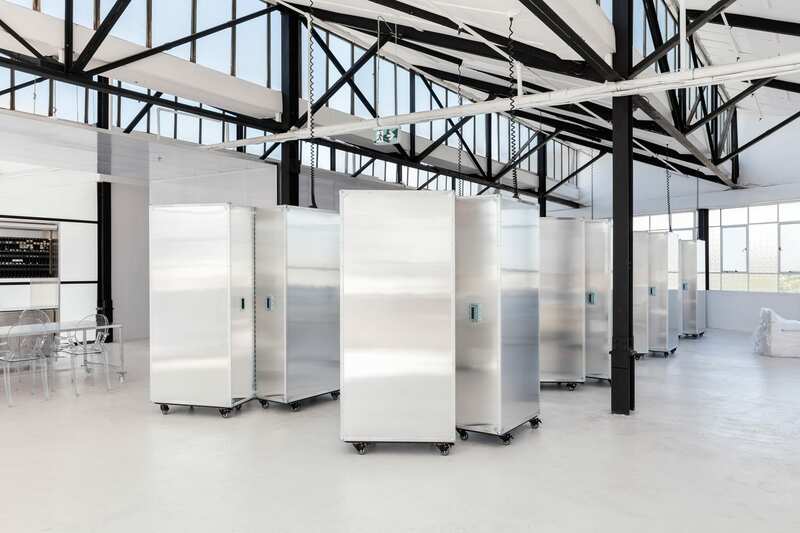 To create the salon’s unique styling pods, George enlisted Nova Forge Caseworks to create custom cases out of mill finished aluminium cladding, with aluminium joinery and mirrors inside. 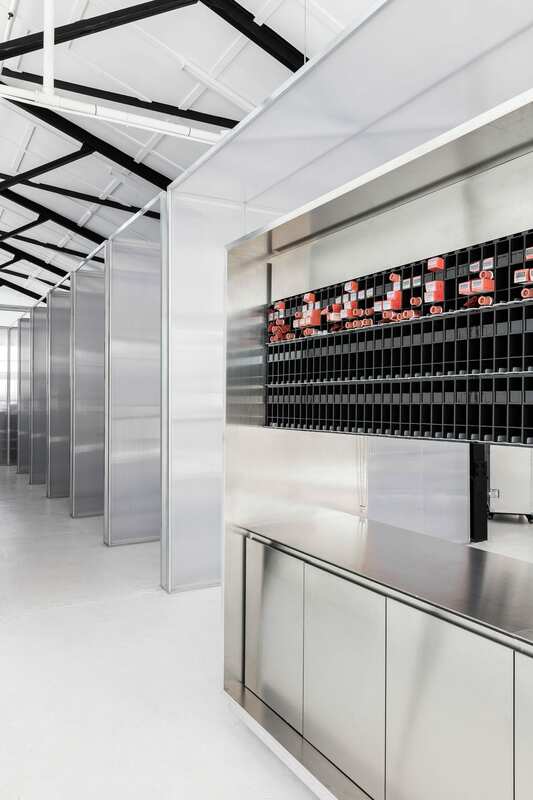 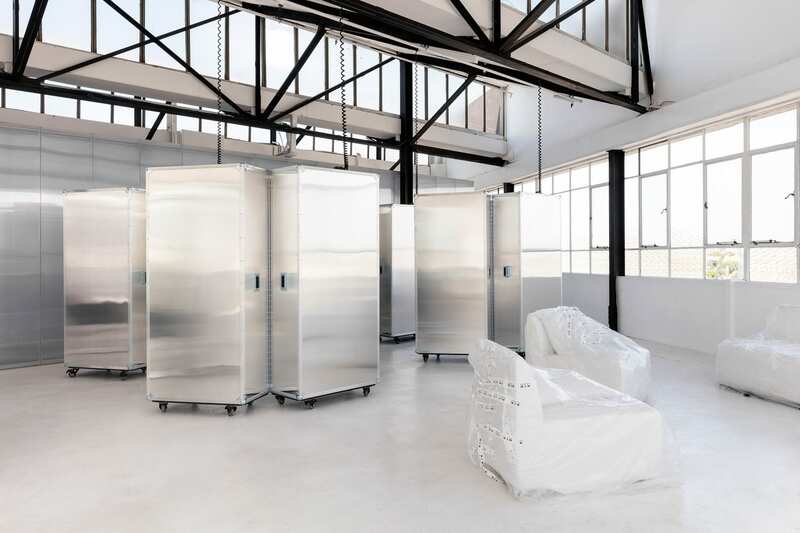 The glossy, fully functional mobile pods connect to power via a cord, and – as well as looking really cool – create a more intimate experience for each salon client within the open warehouse space. 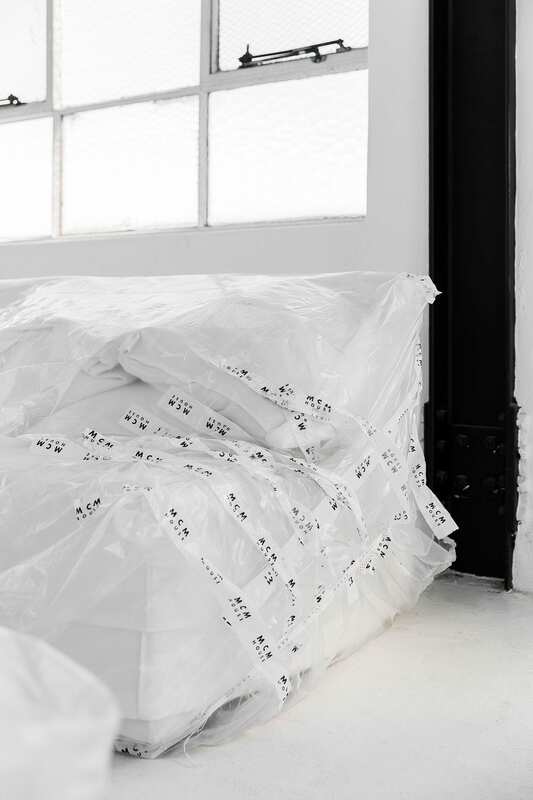 In one corner is a collection of white couches cloaked in plastic that appears as if it’s a permanent fixture – a pretty edgy idea that seems natural in the industrial space, and one that George also worked into the function room at Chin Chin Sydney. 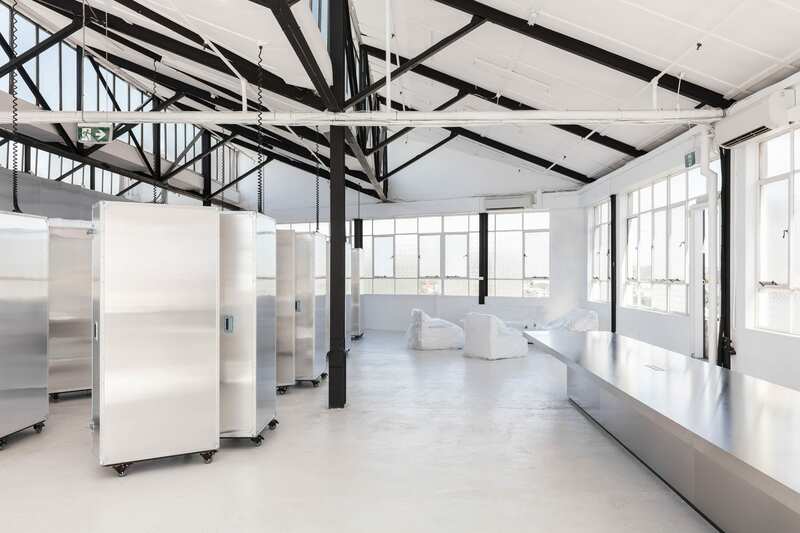 The salon’s storage and wash areas are concealed via a frosted polycarbonate structure, which also acts as a backdrop to the studio. 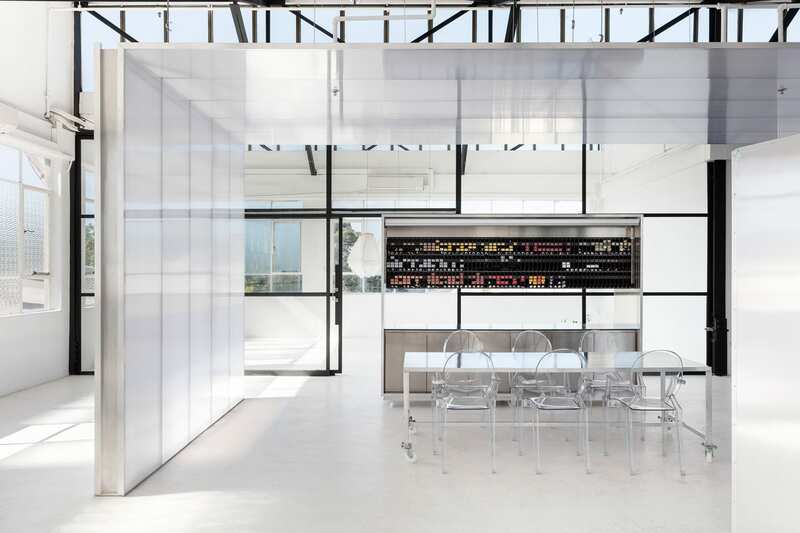 A large colour mixing lab and entry counter doubles as a large working table for classes, and is encircled by six Philippe Starck Ghost Chairs. 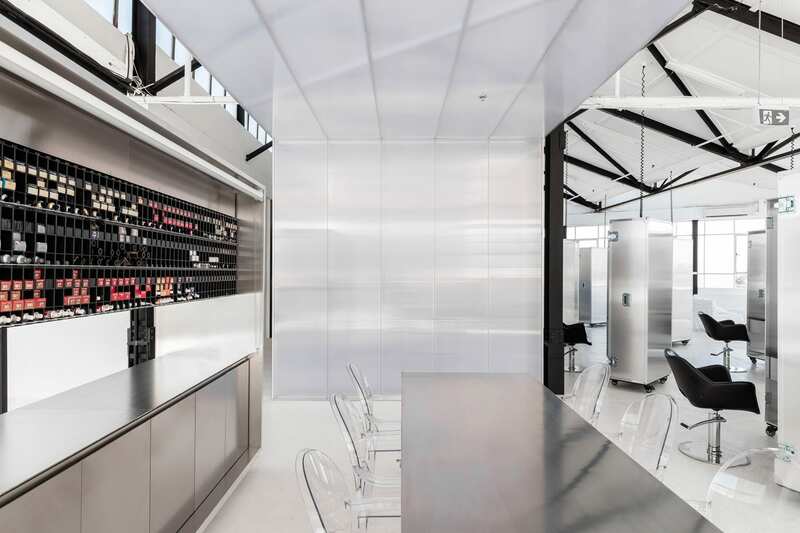 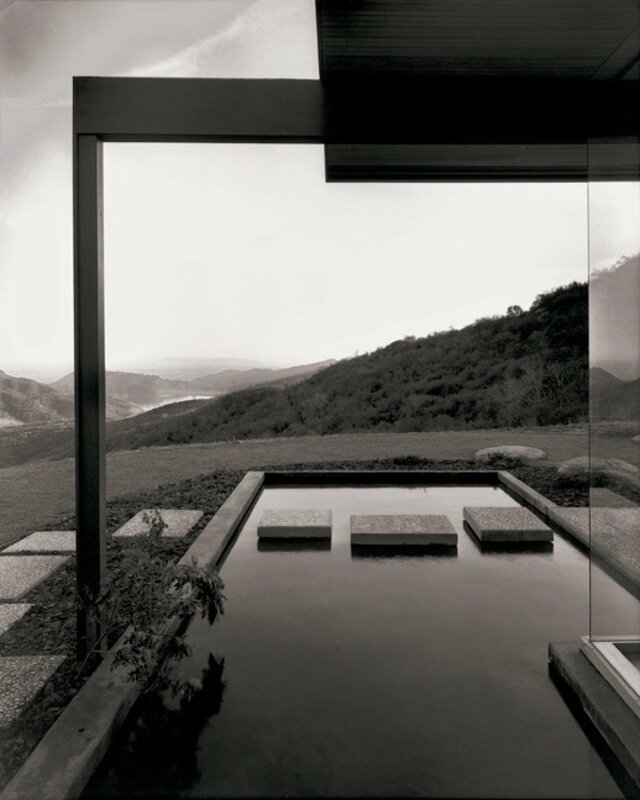 Related: Stories On Design // Metallic Interiors.